In the last year or so many of the typosphere have noted that there’s been a dramatic increase in the price of typewriters sites like eBay and Etsy. While the market for these machines is growing and typewriters are no longer seen as valueless antiques sitting in the garage, there’s naturally been a steady increase in interest in information on typewriters online. When Rob shut down his blog last week, we had an interesting opportunity to get a small insight as to what kind of impact our blogs are having on this this audience. I’ve been quietly watching for cues on what my own blog does with a new generation of collectors, but the shutdown of Rob’s blog gave me an larger insight of its cultural impact. This is graph from my blogger page that shows the activity on my blog over the past week. This graph depicts the activity of views on my blog on a more or less hourly basis. As you can see the peak viewing point over an hour was 40 individual views, while there were Interesting activity lulls. My blog tends to receive a fair few hits from Rob’s blog, but his blog isn’t typically seen in my top 10 referrer sites. The typosphere page usually sits at number two, with the bulk of hits to my blog coming from people looking at other pages in my own blog. In essence, I am my own greatest referrer. 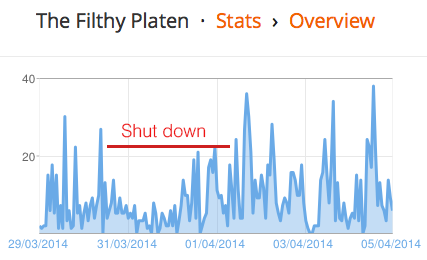 But while Rob’s blog was down, something did happen to the activity on my blog. As you can see on the graph above, while Rob’s blog was down I had a period where activity in some hours dropped frequently to nothing, while it only had occasional peaks of interest. During this time there was a flurry of posting on Facebook and in the forums about Rob’s blog being down. As the period progressed, I started to get steady increases of interest that would drop off suddenly. But when Rob’s blog went back up, there was a flurry of activity. Which made what happened next also interesting. It took a day or so for the forum readers to catch up with the news that Rob’s blog was back online. But about the time that the postings in Yahoo and Facebook stopped, there was a 6 hour period when my own blog seemed to grind to a halt before the two-spike ‘evening shift’ pattern started again. See how with every peak there’s a smaller occurring peak before it? I suspect that’s the time difference between the east and west coast of the USA coming online in the evening to do some reading after work. Unfortunately the scale on blogger’s graphs is hard to interpret accurately. Notice those spikes missing anywhere? On the 31st I had absolutely no sign of that ‘evening spike’. Let’s have a look across a broader period. In this graph you can see the I have a very clear ‘Sunday reader’ spike. This is why I tend to post most of my blogs in Australia on a Saturday night, or a Sunday day so that it corresponds with the reading periods of the audience both here in Australia and overseas. It is also the day that eBay makes their most money, as the sales items on that day tend to sell higher as there’s a larger amount of people around to bid against items. While Rob’s blog was closed my Sunday peak was less, and the general readership over the week decreased notably. This has also corresponded with another interesting trend that I’ve seen occurring. There is a notable impact of blog entries on interest in specific typewriter sales. For example: When I presented my completed chrome Royal on my blog some time ago, a second hand dealer in Singapore rushed to get a similar machine which they then proudly displayed online. When I displayed my Apothecary typewriter, the same seller also highlighted a machine they themselves had owned. Remember when I displayed my burgundy Groma Kolibri? Well, a unit that had sat unsold for a while on Etsy at quite a high price, sold the next day. I’ve seen very similar things happen with machines displayed on other people’s blogs. What I’m seeing is a ‘drive to buy’ that is driven by ‘typewriter culture’ blogs like my own. What I write about on Sunday sells on Monday. Rob’s blog has a massive impact on this ‘typewriter culture’ audience, and his blog can shift attitudes of larger groups. To all intents and purposes it is very similar to the impact that Oprah has across consumer culture. Rob’s blog doesn’t rule the typosphere, but it has enough gravity to change the trajectory of things that come close. This has happened as a result of one single thing: The sheer size of Rob’s blog. While the quality writing and research has brought an audience, the frequency of Rob’s writing has meant that Rob’s blog gets far more reads than every other. The sheer volume of Rob’s blog creates enough hits through google with both data searches and images that it is constantly near the top of almost every typewriter search topic. Were Rob to stop writing his blog tomorrow, this wouldn’t stop. The amount of material that Rob has written attracts so much of the audience that it will only continue to grow. This phenomenon is observable in my own blog. This has happened to my own ‘Hate letter to my Valentine’ blog entry. Every year it gets more and more popular due to the ever increasing number of hits it receives. This year the gravity of the readership took my blog from an average 100-250 readers a day to 200-350 readers a day. 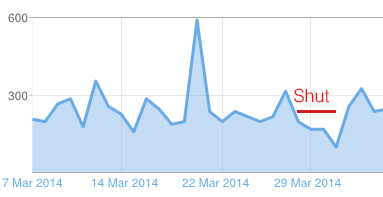 As I get more and more reads, the pace of my own blog’s readership has increased. So you may be wondering why I see this as a lost opportunity. Well, I think we have gotten the wrong idea of what a collector is as a group. Collecting is always going to be seen as a personal thing, but it also tends to be a community thing at the same time. In the past there has been a distinct view as to what is a typewriter of value, and what is not and this is something that is passed along by an involved community. Were you to regard your collection by its value, other collectors would (and rightly so) scoff at you. No one collects anything necessarily as an investment. Indeed – limiting the size of your collection is likely to improve the value of sale later on if you wish to choose it, rather than stockpiling. But typewriters now have a social currency that it didn’t have before. The curious are seeing the ‘hipsterism’ of typewriters, and are finding themselves curious about machines that they have never had to use in a work situation or professional capacity. Typewriters have become hobby tools and are associated with creativity, rather than the bureaucratic purpose that drove their development and sales for over a hundred years. it is at this point that we are seeing a dramatic change in the face of what is a ‘typewriter collector’. Machines that were previously seen as worthless actually draw more interest. Sure, we’d all love to own those beautiful antique machines that we’ve seen in other people’s collections, but at the same time machines that are immediately usable and yet beautiful have greater social value. People get more excited about finding a very common Hermes 3000 in 50’s adornment than they do about seeing a Oliver 2. Other factors other than age and rarity have become key in what is driving the cost in typewriters. Colour, design, associated author and usability have a greater impact. A Hermes baby in 50’s ‘winged’ configuration often has a greater value than a Corona 3. Only a minority of people collecting older machines will typically ramp the price up against each other. By large the people that have only hand full of 30’s to 70’s machines that make up the bulk of the community fight over more modern machines that these others reject – pushing their prices up dramatically. Typewriters have now become industrial art. People may just buy one or two, but it is the beauty of them they are looking for. To this end a glossy and shiny Underwood 5 has a greater value than, say a creepy looking Williams. Effectively the face this kind of collector is an art collector. And these are the collectors that are searching our blogs to look at the history of typewriters. The typosphere blogroll is an audience engagement portal. While we often write blogs at other bloggers, the reality is that the’typosphere’ readership are largely people that we don’t know. People read up and look for information on the machines that they have on hand before moving on and looking at the history in general. There is an excitement about the history potential of even the most basic machines as they seek the context they exist in. Dismissing a machine as ‘common’ neglects to value some of the artistry and history that is potentially in every machine. And linking to pages of people with similar interests actually is really important to this community engagement. People will snake through other people’s blogs for hours when they first feel those initial moments of passion. When they get a spark of something interesting, you have a potential for further audience engagement for the writers and creatives amongst us. It is to this end that I feel in some of the associated publications that are around have rather missed the boat. Magazines and books seem to have neglected this audience. People start to find their interest in typewriters on the internet now days. When people read up on something on my blog or Rob’s blog, that isn’t the end of it. They look for more. Magazines and books aimed at the attitudes of older collectors means that people have actually missed the bigger audience. It also means that we have missed other opportunities. For example, what appears on someone like Rob’s blog one day, will drive a curiosity to find out more elsewhere the next day. I’ll let you draw your own conclusion to why that has been a lost opportunity. PS. Again, don’t be shy if you feel that I have no included your blog in my list down the side. Until recently Cheryl’s Strike-thru blog provided about 12 percent of my hits, and often exceeded what the typosphere page brought to me. If your page isn’t there it is probably out of neglect and laziness, rather than a lack of interest in your blog. ← Thoughts on 3D printing a typewriter. Very interesting, Scott. I'll be thinking about this for quite a while. Yes, verrry interesting….. Thanks Michael. Was worried that I might think people thought I was ranting. But I've covered a few things in here I've been looking at for a while. I wonder what random people who happen upon my blog think. Some posts have a view count that is wildly out of line with the number of comments I've recieved, usually on random topics that people must find while google searching. Did they find what they were looking for? Or at least, something useful and interesting? I wonder how many times people have run across a typosphere blog and gotten sucked in and bought a typewriter. With the internet, our influence can occasionally stretch far outside our sphere. Speaking of, it looks like my old blog is still linked to the side but not my new address. There are a number of good thoughts here. You draw our attention to the currents of interest that surge into and around the typosphere and aren't reflected in the public comments that a few of us regularly make. I often wonder too. But then I realise I can relate myself. I too had the same feelings and ideas when I first started collecting. As for your blog…. Fixed. In a lot of ways I feel that the comments section is seen as a bit of a no-go zone for the casual reader. They want to engage, but they see other consistent commenters on these blogs, and feel that they may not belong. Also, they may feel that their opinions or questions may be attached and ridiculed by the public. For a condensed view into the public thoughts that do not make it into the comment areas of typosphere blogs, read through the long list of entries in the subreddit, r/typewriters. I've given up trying to put URLs into comments, so try going to reddit.com and searching for typewriters, or adding the snippet above to the end of that address. It is a distinctly separate group of typewriter-interested people from the typospherians. Have Fun! Scott: At the risk of sounding like a broken record, your presentation of the stats are very interesting. Robert does an amazing job of documenting the once obscure machines that have captured our imaginations. Whenever the fancy strikes, my first search terms are his blog, Richard's Writing Ball and the name of the machine. As you point out, the shear volume of information and the availability of increasingly better search tools make a difference. Once an author on the web becomes trusted and authoritative, things snowball from there. There are perhaps a dozen photography websites by established personalities that get a disproportionate share of traffic. Robert happens to be authoritative in something with a smaller market. You've exactly put your finger on something I've been thinking for a long time. As a collective, the Typosphere holds an impressive amount of persistent eyeballs and pretty astonishing Pagerank. That this hasn't been translated into commercial opportunity already is interesting, and telling. Not that it hasn't been tried in one form or another. Many blogs have an adspace (including mine, mostly as an experiment in finding out if there was any point to it – the answer so far is “no”), and there are services offered on some typosphere blogs, but other than typewriter pads I haven't heard that anyone's been unusually successful. Publications like ETC, etc. should be blossoming with new members in theory, but I don't think that's really happened either. Perhaps we're just not trying hard enough. Ted, any further word on “Collexion”? That looked commercialish. I know what you are thinking about there, Ted. I've personally avoided using the 'adspace' option because I always anticipated that it would offer pretty much nothing. As for success, well.. I think there hasn't really been a targeted attempt. To be honest, it is a bit of a double-edged sword engaging with the audience of the typosphere. 'Exploit at your peril'. People write on it because they are passionate about a personal hobby, and they get pissed off when you attempt to exploit there work for personal profit. Hence why there's a level of apprehension towards that second hand dealer I often mention. Particularly as they don't offer a level of contribution to the community themselves. It probably doesn't surprise you that I'm not a subscriber of Etcetera. I have found that while the magazine is well written and published, from the copies I have read it offers more to the older style of collector, than the current casual collector. The magazine isn't easily accessible to this audience and targets a pre-existing mindset. The larger audience cannot relate to the people contributing to the magazine, so as such it remains as what it is good at – being a very niche publication for a very niche audience. This is true. But at the same time I think we have missed the greater reach that our blogs achieve. Think about how many of our photos have ended up on Pinterest by people other than ourselves. These are people that appreciate the visual side of these typewriters and the artistry. Often when we have written authoritatively, we've neglected the interest of the reader and how the facts are relative. There's a real problem when we talk about the history of these machines that ends with us talking about weird old white-guys and the things that they 'did'. But the audience also consists of women – who really couldn't care about how X old white-guy funded and built Y factory in Z city. Like a lot of male readers, they're hoping for the drama and the inspiration. Stuff that people who are writing about the history often see as an superfluous. Re: Collexion, I've gone and visited a couple more times. I can log in now. The staff has commented on my post quite eloquently stating in more detail what their goals and intent is. Sounds like they plan to offer much more detailed research information and are actively seeking input. Still being open-minded, but my impression is that it'll end up being a spamhaven unless they have some pretty strict moderation in place. The place is already getting overrun with unrelated posting that's little more than advertising. They're flinging a very wide net and don't seem to be thinking about the sharks they're gonna catch. Oh, Re: advertising, it has struck me that some kind of banner exchange might be useful in offering niche exposure to relevant interests. Even Project Wonderful might make more sense than Google Adwords, as it tends to target crafty niche advertisers like webcomics and people who make typewriter-key jewelry (ok, so maybe advertising keychoppers on our blogs isn't such a great idea). I dunno. I sometimes poke at these ideas, but while the eyeballs seem to be there, the market doesn't seem to follow yet. Still too niche a market, I suppose, but keep in mind that the Typosphere helped to establish a market that JJ Short at least has found worth supplying with platen and feed roller recovering. There will be more as the market for keeping previously ignored machines running grows. To be honest I used to think that surely many of the views had to be phony (even before I got hit with the spam views on my old blog; at my new address the views are real) but I guess that's a silly assumption to make considering that there are probably at least 2 billion people on the internet at least with some regularity. But the rest of your story is quite an eyeopener. Never realized how our blogposts and the Etsy/Ebay sales were connected. Or what an impact we have as a whole. We joke about keeping the Insurgency alive, but we are also really doing that by posting our pictures and stories. Even though that spikes up the pricetags, it's quite impressive!! You've made some interesting points. I think some of the increase in prices on line is 'hey, I have a credit card. I do not care if it costs me a few hundred. My credit line is several thousand. So what is a few dollars a month on a payment?' mentality. Many machines are not worth near the on line cost. So what if in 1960 it cost $100 and today that same cost would be $700 today? The machine is still old and may or may not work. Then a PC can run over a thousand and need replaced in 3 years. My best machines are still the ones that cost me less than $20 a piece. I do have a few more expensive ones, but the price did not make them all that more impressive. Many modern ones are over rated. I used to get much of my traffic via Strike-Thru until Cheryl removed her blog list in favor of The Typosphere. Now much of my traffic comes from there or Google searches on particular typewriters. I started seeing Rob's blog being quoted in Etsy and eBay sales a while back. People's photos have been used off blog sites to sell typewriters, and sometimes there's even been claims that typewriters for sale have even belonged to certain blog writers. The people who do this are usually people that we have never spoken to or heard from. I can see what you are saying, but I'm not too sure about the influence on credit cards. I feel that access to credit has made ebay inflated in general, but there has been a progressive rise in particular typewriters over time in an era when credit has been widely available for decades. That said, some of my best machines have been ones neglected by buyers, and have been bought for that sub $20 price as well. Thanks for that feedback about google. I would love to compare people's data sometime. The trouble is that the data that is provide is poorly referenced and often difficult to interpret. Thanks for the tip! I'll have to check that out. Speaking for myself, I like Rob’s blog because he helps me understand how typewriters fit into daily life when they were THE standard professional writing machines. It’s a kind of historical interpretation that only intense, consistent research can produce. Anyone can talk about how a typewriter works, but that is missing the bigger context of just how important these machines were (and still are, in some respect). And yes, eBay is hyper-inflated. I never go there to look at typewriters. It seems to be full of people who are trying to cash in on the antique craze and hope nobody will notice the line in the description that says,” I don’t know if this works or not.” I’ve even see junky “parts” machines being sold for 50 USD plus the cost of shipping! But I agree with the others. This was a very interesting post! Kudos for noticing the trend.